Reid Community Benefit presented a check to the Richmond YMCA to help fund their Fitness-On-the-Go Program. Director Misty Hollis explains how this program holds exercise classes, like yoga and zumba, all throughout the city. These funds are being used to help replenish food stocks. These funds were donated to help initiate a new weight-loss management program at the facility. These funds were donated to provide a new diabetes prevention and LiveStrong program. This donation was made to continue running the facility, whose aim is to feed the community. Angela Cline of Reid Health Community Benefit visited Starr Elementary as Gleaners Community Food Bank dispersed healthy produce as part of their Drop & Go Program. Community Benefit presented the Cardinal Greenway with a check to support various programs, including their Bike Loaner Program. Amigos, Richmond Latino Center was awarded a check for $2,930 to help fund a health fair they plan to hold in September. The grant will help fund the various activities within the six-week program for students grades 1-6. Community Benefit of Reid Health visited Diplomas at Richmond High School. 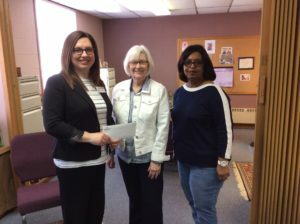 Angela Cline presented the program a grant award of almost $3,500 to support the work they do in caring for the health of teen mothers and their children. 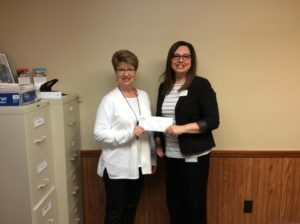 Angela Cline of Reid Health Community Benefit presented Cope Environmental Center a grant award to help support their new fitness program which allows participants to track their outdoor activities. Reid Health Community Benefit presented Richmond Parks and Recreation a grant to support their “Get Healthy in the Parks” initiative. Get Healthy in the Parks program has many components including a walking club of 100 participants. Among the construction at Middlefork Reservoir, Angela Cline presented Richmond Parks and Recreation a grant award to assist in the continued revitalization of the park. Community Benefit was in Connersville to present members of the Fayette Foundation a grant award. The funds will purchase equipment for the future site of an all-inclusive playground at River’s Edge Park. The playground will be for children as well as adults. 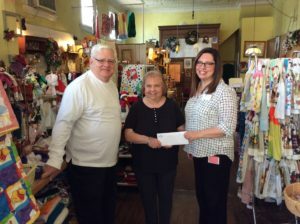 A grant was awarded to help fund the Fresh-Up Bucks Program for the Connersville Farmer’s Market in April. The program doubles the purchasing power for Snap beneficiaries who purchase goods at the market. Angela Cline presented Caleb Smith a check to help fund the Richmond Farmer’s Market’s Double Bucks Program. The program gives Snap beneficiaries double the purchasing power-being a win-win for community families and local farmers. Mayor Dave Snow was in attendance to acknowledge the Farmer’s Market for being one of ten recognized nationally by the USDA for National Farmer’s Market Week. Angela Cline of Reid Health Community Benefit visited the Council of Rural Service Program in Greenville, OH. The grant funds will go toward a new fitness program and curriculum for the organizations alternative school and after-school program. Angela Cline of Community Benefit presented Pam Kirk a grant of $7500 for the Thump Jumpers program. The program seeks to expand its reach to mor schools as it enlists students in the extracurricular team sport. Angela Cline of Community Benefit presented Birth to Five a check of $17,600 to support their Parents As Teachers Program. Angela Cline of Community Benefit visited the Hope Center in Connersville. She presented the clinic with a grant check of $17,080 to help replenish and sustain the center’s Blessings Boutique. Clients of the center are able to purchase goods from the boutique after attending certain programs. Items include baby formula and hygiene goods. Angela Cline and Community Benefit visited Fayette County Community Voices in Connersville to present a check of $21,000. The funds will help their summer program which enlists students grades 2-6 for several activities involving the wilderness. For summer 2019 they will focus on plant life. Reid Health Community Benefit visited the Boys & Girls Clubs of Wayne County to present them a grant check for $15,000 to help support their Club Fit Program. The program focuses on physical activity and nutrition for their youth members. The Club had a special message for Reid. A Better Life – Brianna’s Hope is a statewide faith-based recovery program. Based in Portland, IN, the participant-driven organization provides hope through Christ to those impacted by addiction. The Richmond chapter was awarded $4500 to support its efforts in healing families and communities ravaged by substance abuse. For those in our community living with disabilities, Achieva Resources works tirelessly on their behalf. The agency works to serve their clients best interests. Whether its assisting in everyday tasks, to helping them maintain living independtly – Achieva’s aim is to be the voice for those who cannot speak for themselves. Their grant of $10,000 will help fund staffing for their guardianship program. Birth to Five caters care for families, focusing on children rendering and mothers. Their Healthy Families program focuses on smoking cessaton for mothers and mental health. Their grant of $12,900 will help fund this program. Boys & Girls Club of Wayne County has served the Richmond community for many years, gearing our youth to become bold leaders of the future. This year they received $18,950 in a grant to fund their Prevention Plus programming. This program aims to steer children from a life riddled with substance abuse. Centerstone is one of the premier mental illness treatment centers throughout Indiana. In Richmond they do their best to serve citizens of all ages who live with a mental disorder. The funds receieved through this year’s grant cycle will equip the agency to initiate a program addressing depressiong among Medicare beenficiaries. The Cross Road Christian Recovery Center is a site for women recovering from drug addiction. The faith-based center received $15,000 to aid in their fight to rebuild lives. Celebrate Recovery addresses addiction in the community on a local level. The faith-based group seeks to advance its serivecs with the grant it received from Community Benefit. HIT Foundation is a Eaton, OH-based agency with the mission: “Everyone in Preble County should have a decent place to live.” Their focus is to curb the shortage of housing options in the rural Preble Co. area. Their grant of $2,000 will help fund their Senior Home Repair program. Connect 2 Help 211 is a resource database that non-profits and agencies utilize to be aware of the different programs providing services across the Eastern Indiana area. Their grant of $2000 will help fund support in several local counties. Indiana University East continues being a beacon of education and advancement for the East-Central Indiana area. A stepping stone for those who seek higher ground scholastically. But for some students, those steps are harder to maneuver. A grant of $7,500 will assist in partially funding a student advocate position to aid at-risk pupils from falling through the cracks. JACY House is a local advocacy group which fights for child’s rights against abuse. They create a safe space for victims and families to retreat in times of need and healing. The agency received $12,000 to continue its work in protecting the most vulnerable. These funds will support JACY’s “Speak Up Be Safe” program. Meridian Services administers programs to those suffering with addiction. In recent years these needs have intensified, making Meridian’s demand as high as ever. The $5600 they were rewarded will help fund enhancements of their residential treatment program. The New Paris Community Food Pantry is an entity that works out of a local church in New Paris. Pastor Jeff Ginter leads the group in offering many services to those in need. A new initiative from the program deals directly with the opioid epidemic. The group received $10,000 to purchase Narcan kits. These kits are a part of the pantry’s certification process to become a Deaths Avoided with Naloxne (DAWN) site. Open Arms Ministries is a faith-based coalition of churches and other groups in the greater Richmond area. They provide need-based services with the intent to not only provide a need, but transform lives. They received a grant of $2,675 to assist in providing emergency assistance for families affected by drug-related incarceration or treatment. Richmond High School health teachers saw the need to teach their students about the dangers of alcohol and substance abuse. To demonstrate how impaired one can become on these substances, they applied for a grant to purchase Fatal Vision goggle kits. These kits are used to show teen show their senses are limited when under the influence. Senior Opportunity Services is a volunteer-operated agency that assists adults 55 and older in the workforce. Their services help serve the elder community in providing odd jobs to those who cannot handle big tasks on their own. Their grant of $5,000 goes toward their Homemaker & Handyman Program. House of Ruth is a transitional residence program assisting formerly incarcerated women. The grant awarded through Community Benefit will assist in their efforts in helping these women matricualte back into society. The funds will staff a fourth house which will house women and their children. YWCA Genesis is a domestic violence shelter for women and children to retreat from harm. They provide services to help break the cycle, as well as outpatient counseling for women who are seeking aid. 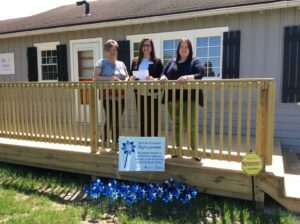 Their grant of $10,700 will help support the counseling services.